My reading remains the same, Little Women, and I'm reading a little speedier because I've added an hour or two during the daytime hours. To switch things up a bit I've decided to photo the magazines I've been enjoying. Over the past three years I've discontinued my subscriptions of magazines because they keep stacking up and I don't knit from them very often since Ravelry is my go to source. However, whenever I see a knitting magazine at a bookstore, I give it a flip through. Both of these magazines had more than one project that I could envision being on my needles. 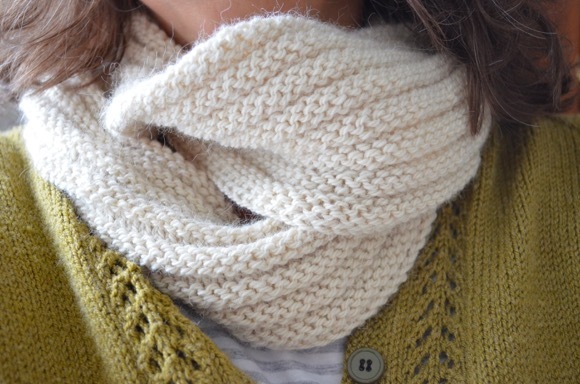 In the photo is a comfy cozy cowl on size 10 needles, yes! size 10! I must say I do love how quickly the knit is going but I will always have a special place in my heart for the tiny needles. It's where my loyalties lie. The cowl is knit out of yarn that I received as a gift from a friend who shopped at a local to us alpaca farm. This wool is soft! and I love when I come across a tiny piece of straw. If you haven't read yet, I finished my pendulum shawl. You seem to buy knitting magazines the way I do. :-) Except for the fact, I tend to buy them while visiting my family in Germany. I'm looking forward to seeing the finished cowl, the yarn looks so soft! I have some alpaca that my son brought me from Vermont and it has to be some the softest yarn. I don't subscribe to magazines either, but when I am out and about I always pick up a knitting mag just to browse though, that is how I found the ribbed tank pattern. I'm the same way with magazines! I used to subscribe to a few, but only knit one thing out of them so stopped. Now I look through them at the store or at the library! I love your new shawl...it's going to be gorgeous! I like large needles too but like you, I'd rather do the small ones! I feel the same way about knitting magazines! That yarn looks so soft and lovely. I always feel like I'm knitting with tree trunks when I use anything above 7s! I don't get any magazines anymore except Spin Off. I hope they switch to digital soon. I hate having the magazines all over the house! It's getting to be the season for cowls. I already planned some to knit for myself as well. I can't believe how quickly things knit up on size 10s! But my true love are those itty bitty ones. Big needles always feel "weird" to me, too, but I do love how quickly they work a pattern. ; ) Alpaca is soooo soft and warm--your cowl is going to be dreamy; I can't wait to see it finished. I've eliminated all of my magazine subscriptions, too. I only treat myself to a magazine once in a while, when I see something I *really* want to knit, read, cook, etc.They are good for new ideas and inspiration. I did give the Knitting Tradition one a flip through when I went to JoAnns last week. Just the fact that it had a Herbert Neibling inspired lace pattern would make it worth the price. Unfortunately, that magazine is a little out of my price range right now (especially since JoAnns doesn't let you use coupons on magazines anymore, rats!). Flicking through magazines is fun sometimes, I haven't seen any decent ones around here recently. Nice yarn, I can imagine the soft as a friend just finished a project in homespun alpaca, beautiful. i love using big needles. lol although i have come to enjoy knitting with the itty bitty ones. the cowl looks great! small needles are fun, hey! I love them all but the small scarf I just did on 3s was so dainty and fun to knit! Like you, I depend on Ravelry for my knitting ideas. But I do enjoy going through magazines to see new tools and techniques. Such a rich, pretty yarn for your cowl. Loving that yarn, the cowl is going to be gorgeous. size 10! You must feel like it is flying by! I don't buy so many magazines now. All subscriptions have gone. Just the occasional one now. I know exactly what you mean about finding bits of straw. Always makes me think how real the yarn is. I saw those magazines at Jo-Ann Fabrics and almost bought both of them as well. I might go back and get them. I love big needles and Little Women. I should reread it, maybe I will after I finish To Kill A Mockingbird. I love speedy projects using big needles - it's instant gratification :) I just bought those very same magazines - love them both! I love big knitting projects! They go so quickly and there is such a sense of achievement! Looking forward to seeing you modeling your new cowl! How lovely being gifted the alpaca yarn, especially when you know where it comes from. Must be lovely and soft to knit. I love using big needles at the moment too as I don't have much time for knitting at and it grows so fast. 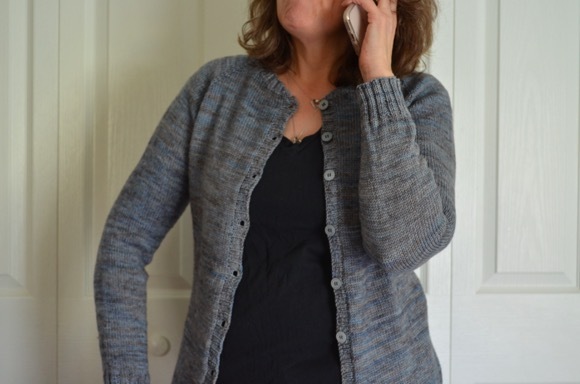 I finished the body of my cardigan and so could at last try it on. I loved working with the linen yarn but it's much too big even though I checked the tension first. I think the linen yarn is a bit too heavy for the pattern too so I'll be unravelling it. It was fun while it lasted and easy to do...lots of knitting whilst a passenger. I haven't had time to read though but looking forward to getting back to The Accidental Tourist, hopefully doing more once the garden is ready for the winter. Yeah, with Ravelry there's very few reasons to buy books/magazines for crafting! 'Looks like you're making progress. 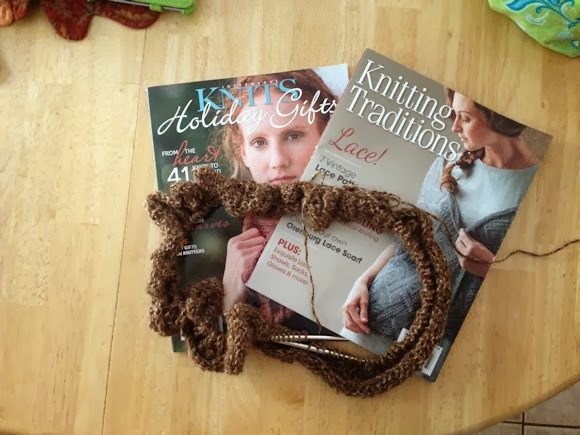 Hi Karen....that cowl sounds like my kind of project :) I have been knitting a sweater, but it's taking me a while so I haven't linked it up. I think I'll wait until it's all finished. I love ravelry, too. Pinterest can also be kind of fun! I understand about the magazines! I used to have a sole subscription to the New Yorker, but when the recession hit, I was inundated with all kinds of ridiculously cheap subscription offers, and, wanting to do my part for print media, I accepted them all! Now I think I really have too many! However, I just got an issue of Knit Simple in the mail, and there are some really fantastic gift project ideas in it. Looking forward to spending a bit more time with it! Your new project looks so soft...love the color!